Growing your own food is a pleasure in itself, but growing food from seeds you have sowed and saved over time can be a truly empowering experience. From just one seed you can get hundreds or millions more. By saving your own seed, you are growing strong plants adapted to regional growing conditions, preserving rare varieties, supporting biodiversity, & saving yourself money! Diversity: Saving seeds increases community access to an incredible variety of crops that cannot often be found in grocery stores, & are becoming increasingly rare on an international scale. Adaptation: Over time, collecting seeds from healthy plants will allow seeds to adapt to and thrive in your garden, region, and in response to climate change. Preservation: Heirloom seeds contain the history of farming within them. Saving seeds helps protect that knowledge as well as the unique crops they produce. 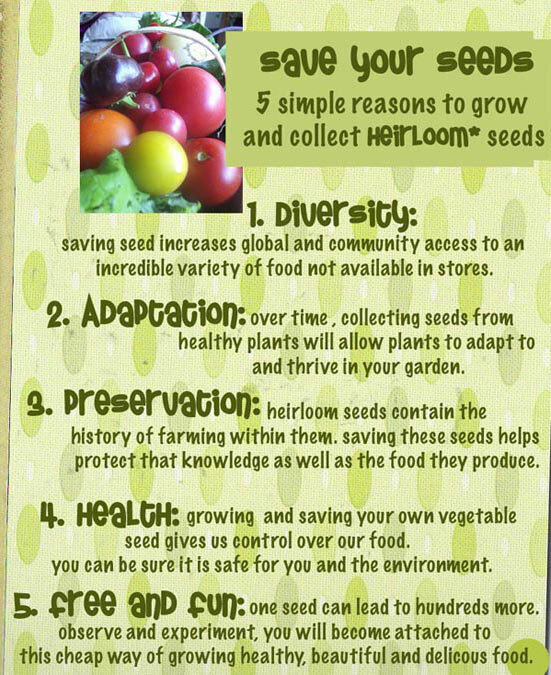 Health: Growing and saving your own seeds gives us control over our food straight from the source. You can be sure it is safe for you, your community and the environment. Free and Fun: One seed can lead to hundreds more. Observe and experiment, you will be attached to this cheap way of growing healthy, beautiful, and delicious foodTaste & Beauty: Heirloom vegetables, in all their colours, shapes, sizes and variety are incredibly beautiful, and guaranteed to rival any conventional crop in taste. Try for yourself. Taste & Beauty: Heirloom vegetables, in all their colours, shapes, sizes and variety are incredibly beautiful, and guaranteed to rival any conventional crop in taste. Try for yourself.